This short, steep hike gives you broad views until you get to the mouth of this wonderful slot canyon with steep, towering walls. Start at the trailhead for Weeping Rock. After crossing the bridge at the beginning of the trail, go straight towards Observation Point instead of left to Weeping Rock. The trail begins its steep climb for a little over half-mile on a paved trail to the signed junction where the Hidden Canyon Trail breaks off. With each step, the views of this section of the canyon get better and better. Take a right at the signed spur trail for Hidden Canyon. This unpaved section of trail switchbacks as it gains more elevation. Parts of this section are along cliffs with steep drop-offs with some chains to give you something to hold on to. It continues to follow the contour of the wall as it goes around an outcropping, ducks in, then back around. While the trail follows the mountainside, you alternate between being out in the sun with great views, to being tucked into the rock and in shade. The official trail ends at the mouth of the canyon with a couple of pools that are easily navigated. 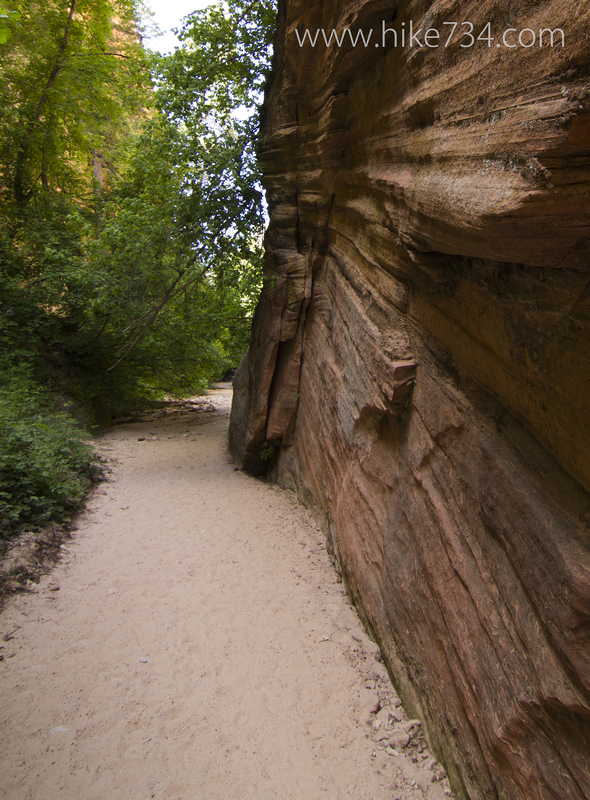 From here you can either turn around or add more than half-mile each way to walk up the slot canyon. There will be minimal scrambling until you can no longer continue without climbing that needs ropes. A subtle and beautiful free standing arch along the southwest wall is easily missed. It provides a nice place to turn around. Be aware of the weather as Hidden Canyon is a slot canyon with no place to escape in the event of a flash flood. Note that any travel beyond the point needing a rope for canyoneering requires a permit from the Park Service.